It is well known in the miles and points community that American Airlines has very strict stopover rules. They do not allow stopovers on domestic tickets and only allow a stopover on international tickets in the “International Gateway City”. A Gateway City is generally defined as the last city where you either arrive to or depart from the country. For example, if I am flying LAS-JFK-LHR, then New York is my Gateway City. Jeff: For clarification, the AA stopover gateway city is the first North American city you touch when on a flight award TO North America, or the last North American destination leaving FROM North America to another region. Last week I was planning our flight home from Honolulu as the first leg of a trip to Japan in April, when I discovered something odd. The American Airlines website was allowing me to use Las Vegas for a stopover despite it not technically being a Gateway City. For some reason the website was letting me book HNL-LAX-LAS (Stopover) -LAX-NRT. In this scenario LAX is the gateway. Technically the flight to/from LAS should be a separate ticket and require more miles, but it doesn’t. 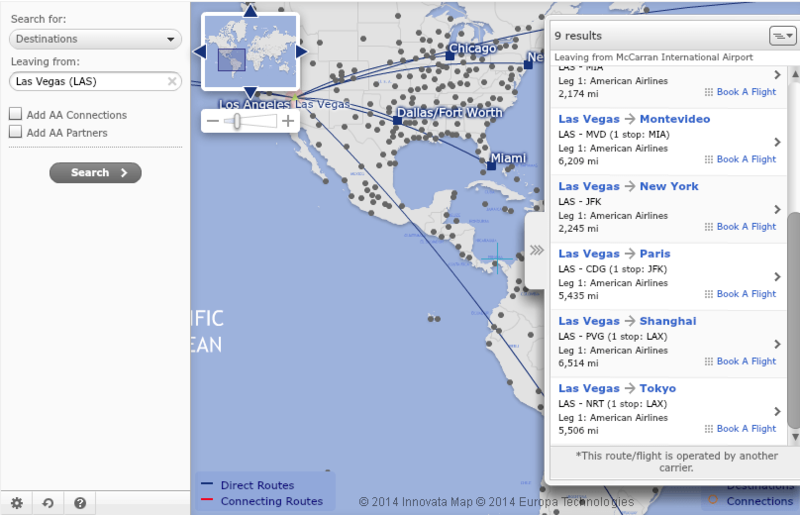 Website allowing me to have an AA stopover for free in Las Vegas in route from HNL-NRT. While I immediately booked the ticket, my curiosity with why this was working didn’t go away. To find out exactly what was causing this stopover to work, I started to check the same itinerary with stopovers in other western cities. I changed the stopover from Las Vegas to San Diego, San Francisco and Phoenix and none worked. I was confused. Why was it allowing Las Vegas as a stopover city? Finally, I consulted AA’s route map. To ensure I was only searching for direct flights on American Airlines, I unchecked the “Add AA Connections” and “Add AA Partners” boxes before entering “LAS” in the “Leaving from” search box. This search brought up all of the direct flights from Las Vegas on American Airlines. Once the results came up I immediately knew what was happening. American Airlines publishes a direct fare from LAS-NRT. They also publish direct fares from LAS to PVG & CDG. Even though the flight to Tokyo actually stops in LAX and uses a different plane from LAX-NRT, American Airlines considers it one flight. This is the reason I was able to use Las Vegas for a stopover. You can see the LAS-NRT route is published with a stopover in LAX. Jeff: So the route map shows that Tokyo is a destination from Las Vegas, even though there isn’t a non-stop flight. It seems that as long as AA publishes a “direct” flight/city pair, then you’ll be able to use it as a North American Gateway City AA Stopover on an Award. While it would take too much time to check every single combination, I did find other cities where this trick works. American publishes a fare from Seattle to Rome via New York. (SEA-JFK-FCO) In that scenario SEA would work as the stopover point similar to the LAS scenario. There are also fares from MCO-NRT via ORD and AUS-DUB via JFK that work in the same way. I am sure there are many other examples if you check out the route map and search for your favorite cities. Keep in mind that you will have limited options for your connection. For example, there are 7 flights per day from LAS-LAX, but the only one that will work is flight 169. As you can see from the photo, the 9am departure from LAS-LAX has the same flight number as the 12:05pm departure from LAX-NRT. Other departures from LAS-LAX wouldn’t work since they are not part of that non-stop fare. As you can see, the flight from LAS-LAX & the flight from LAX-NRT share the same number. Jeff: In Shawn’s case, his itinerary was Honolulu – Los Angeles – Las Vegas – Los Angeles – Tokyo. However, the AA system treats Las Vegas – Los Angeles – Tokyo as a direct Las Vegas – Tokyo. That means the itinerary to the computer looks like Honolulu – Los Angeles – Las Vegas- Tokyo (even though we know there isn’t a non-stop from LAS to TYO) and he’s permitted an AA stopover in Las Vegas, because that’s the “last” point on North America before he leaves for Asia. Now let’s recap the steps to finding routes where this will work. Pull up the AA route map. Uncheck the “Add AA Connection” and “Add AA Partners” check boxes. Enter the AA stopover city you would like to check in the “Leaving From” box. Look through the results for international destinations listed even if they have a stopover. If you have previously had to re-position yourself to a gateway city, then you may want to check this out to see if there are any options closer to you. While this trick isn’t game changing for most, it is another tool to help you stretch your miles as far as possible. Jeff: This is a great strategy for those who don’t live in the “common” AA stopover gateway cities, and should save Avios or other positioning costs if you can find a “direct” AA flight from your city. I’m not sure whether this will work with other airlines, in any case it’s a valuable tip to keep in mind whenever you’re booking! You can reach Shawn at his website or on Twitter. Thanks for the post, Shawn! If anyone else would like to author a guest post on interesting concepts like these, please contact me! I guess the other way of checking that is looking for through-numbered flights in the US. That is not true. I just rechecked and you can fly into JFK with a stopover and then out of LGA. I would post a screenshot but I am not near a computer. It works on the AA website if you want to verify. Probably just a case of an uninformed agent. Let me know if you have any other questions. Just to clarify, this has nothing to do with ‘fares’ published by AA. Fares are pricing documents and have nothing to do with the actual flights offered. Instead, this is taking advantage of direct (vs non-stop) flights, which utilize one flight number for a multiple-stop routing. I can not seem to get the free one way for business/first MileSAAver despite there being availability when booking without a free one way. Is this the case or am I doing something incorrect? What route are you looking at? It has to be the published flight number. For example Flight 169 in the post. Perhaps there isn’t saver availability for all segments. 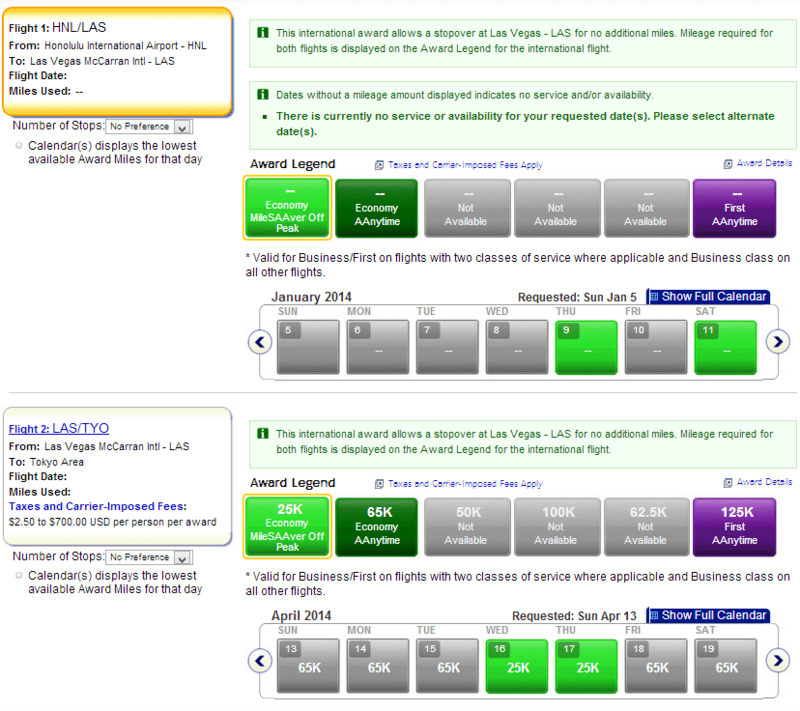 For this to work you have to have award availability both on the HNL-LAS segments and on the LAS-NRT segments. If you don’t want to do a free one-way then AA’s website will price out the one-way award from LAS-NRT at 25,000 miles (depending on season) no matter what routing. If you are seeing availability on this route and it isn’t pricing correctly with the free one-way, then the availability isn’t on Flight 169. I just checked really quickly for April and it doesn’t appear that the Flight 169 combination is available at all that month. When I booked this about a month ago, there was much more availability. Can you give any random examples of a free oneway on any date from a non traditional gateway city that can be booked with biz/first anytime award space (and it doesnt even have to be all segments) .